Double Take Salsa exceeds expectations of salsa lovers throughout the Twin Cities. Our salsas and hot sauces are packed with flavor and have a bite to them. We pride ourselves in the high quality of fresh ingredients and the craft that goes into every product. Each jar of salsa and hot sauce has a complex recipe to create unique, rich, delicious flavors that cannot be forgotten. Once the heat kicks in, it will make you do a double take. Double Take Salsa originated in Edina, Minnesota, and has expanded throughout the Twin Cities. With so many sub par salsas out there, we felt it was time to create a chunky, flavorful salsa that passionate, salsa lovers can enjoy. We started with one tomato plant, which quickly grew to fifteen tomato plants and 30 hot pepper plants. As the salsas and hot sauces were being perfected to the perfect recipes our owner, Bernie, realized he had to share his passion of salsa with others. Watch below to learn more about the creation of Double Take Salsa from our owner, Bernie. Our Salsas each have a story all their own. Each Double Take Salsa product is completely different from anything before. Our salsas and hot sauces each have a personality and unique flavor combination all its own. Visit our products page to learn more about each of our salsa's backgrounds. On our blog Bernie, the founder of Double Take Salsa, shares his salsa expertise and experiences. Don't miss out on some of our handcrafted recipes that are crafted with our salsas and hot sauces. Double Take is a passionate business, and we want to share our thoughts and finding with you, our salsa lovers! 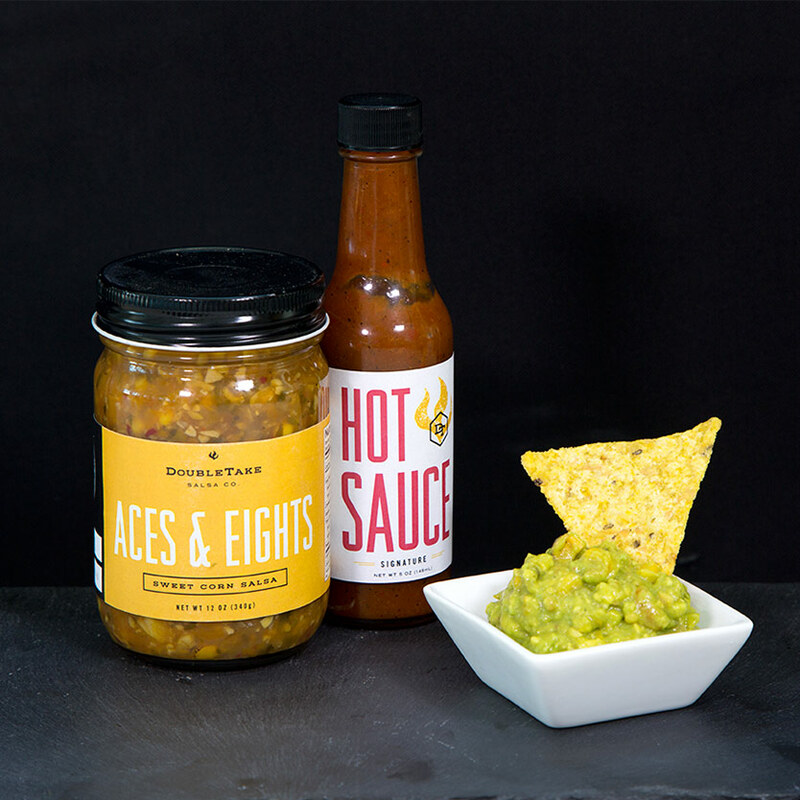 Check out our simple guacamole recipe that only needs Aces & Eights and an Avocado. Step it up a notch with our Signature Hot Sauce as well! Craft, Handmade, Small Batch, Local. Read this blog post by our founder, Bernie, to gain a better understanding of the terms that are often used to describe Double Take Salsa. This is a hearty black bean salsa that will pack a punch into any meal. Check out how Double Take Salsa has added Bewitched to a classic recipe!